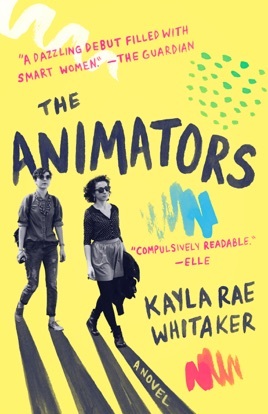 Updating the theme of how artists turn personal pain into art, Whitaker's outstanding debut novel portrays two women working together to create adult cartoons. Mel Vaught and Sharon Kisses meet in a college art class. Confident, talented, and openly gay, Mel anticipates a career in animation, while quiet, lonely, straight, and inexperienced Sharon knows only that she wants to be an artist. Mel introduces Sharon to works by R. Crumb and other alternative animators and comics artists before the two women collaborate on their own dark, funny, carefully crafted work, discovering they perfectly complement each other. A decade after graduation, they gain recognition for Nashville Combat, a full-length animated film based on Mel's early life in central Florida as the daughter of a delinquent mother who went to prison when Mel was 13. Mel and Sharon struggle following the film's success: a drunken Mel rips out the microphone during an NPR interview; they argue; Sharon suffers an aneurism. Renewal for the pair comes with a new project, this one focused on Sharon, who returns with Mel to her eastern Kentucky home to confront her own disturbing memories and reconnect with her one childhood friend. Whitaker deftly sketches settings and characters: Brooklyn is all chain-link fences and loading docks and aging signage, Mel is the fire-starter, Sharon the finisher. Whitaker skillfully charts the creative process, its lulls and sudden rushes of perfect inspiration. And in the relationship between Mel and Sharon, she has created something wonderful and exceptional: a rich, deep, and emotionally true connection that will certainly steal the hearts of readers.